A suspect is dead and several people are injured after a shooting Tuesday at YouTube's headquarters in Northern California sent employees fleeing for their lives. Add YouTube shooting as an interest to stay up to date on the latest YouTube shooting news, video, and analysis from ABC News. Here is what we know about how the shooting unfolded. 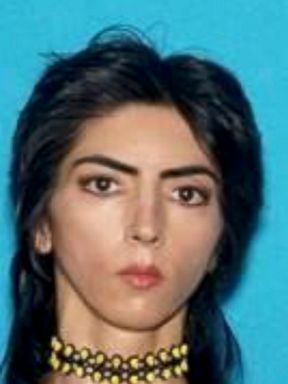 The brother of suspect Nasim Aghdam told ABC affiliate KGTV in San Diego that his sister "had a problem with YouTube." Aghdam, 39, of San Diego, was a prolific YouTube user, but when the company changed its filters and she began to lose viewers, her feelings changed -- Aghdam claimed YouTube was censoring her content and not paying her for her videos. When he learned his sister was in Northern California near YouTube headquarters, he grew concerned and told police that "she went all the way from San Diego so she might do something." "I didn't know she has a gun," he said. "I thought that maybe she was going to start a fight or something." But police in Mountain View, California, near YouTube, where Aghdam was found asleep in her car the morning of the shooting, claim the family did not give them a warning. Aghdam, who had been reported missing by her family, was found by officers asleep in a car in Mountain View at around at 1:40 a.m local time the morning of the shooting. 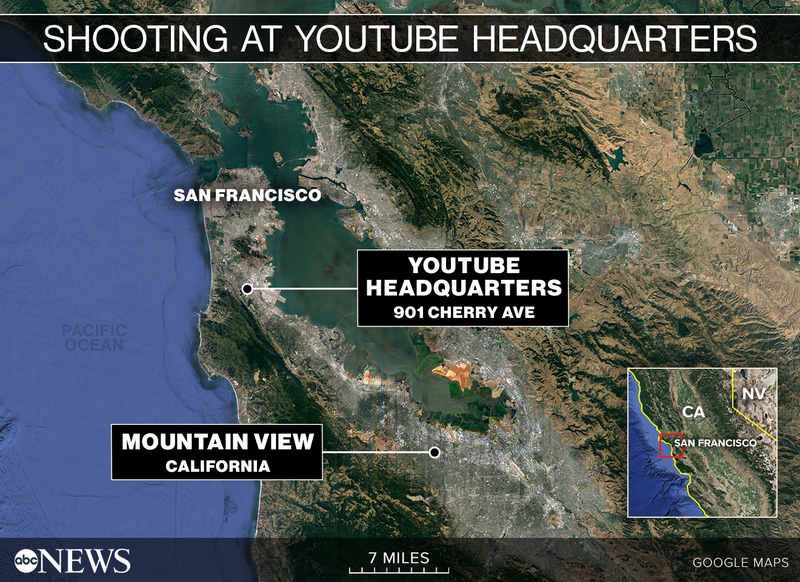 Mountain View is about 30 miles away from San Bruno, where the shooting took place. Several were injured in a shooting at YouTube headquarters in San Bruno, Calif. April 3, 2018. Aghdam told the officers she left her family’s home a few days earlier "due to family issues" and was now living in her car and looking for a job, the Mountain View police said in a statement today. Police said that over the "roughly 20-minute interaction" Aghdam was "calm and cooperative." Aghdam was asked questions including "if she was a danger to herself or others. At no point ... did she mention anything about YouTube, if she was upset with them, or that she had planned to harm herself or others," police said. "She in no way met any reason for us to speak with her further or possibly detain her." Nasim Najafi Aghdam is seen here in this undated file photo. When police called Aghdam's family to tell them she was found, her father "did not act in any way concerned about why his daughter had left," police said. "At no point during that conversation did either Aghdam’s father or brother make any statements regarding the woman’s potential threat to, or a possible attack on, the YouTube campus. Also, there was no indication from either Aghdam or her family that she may have been in possession of any weapons." About an hour later, police said, Aghdam’s father calmly called the authorities back and said his daughter had "made a series of vegan videos for her channel on YouTube and that the company had recently done something to her videos that had caused her to become upset." "Aghdam’s father stated that she may have been in the area because of this. He did not seemed concerned that she was in the area, and wanted to simply let us know that may have been a reason for her move up here," police said. "At no point did her father or brother mention anything about potential acts of violence or a possibility of Aghdam lashing out as a result of her issues with her videos." Sometime that morning Aghdam also went to a local gun range, San Bruno police said today. 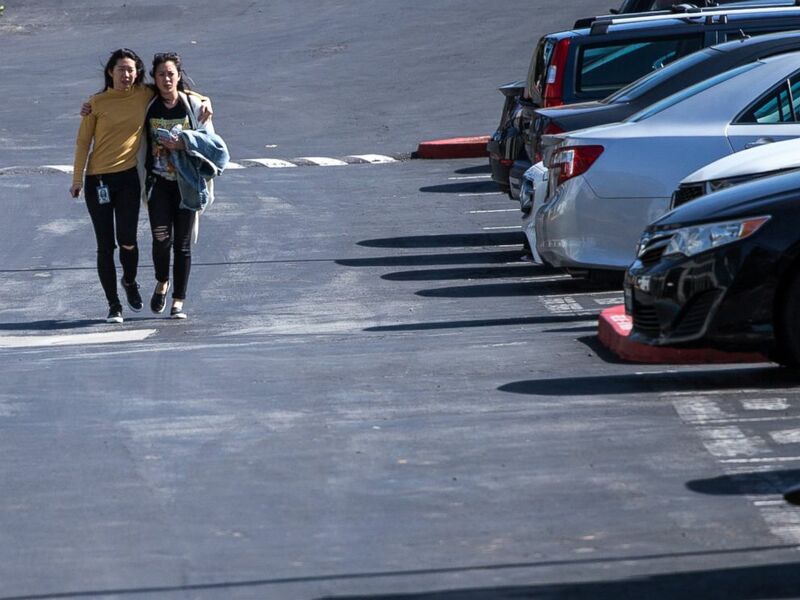 YouTube employees Alina Zhu, 25, left, and Doreen Tran, 25, right, hug as they walk down a parking lot two blocks away from where a shooting at the YouTube headquarters occurred in San Bruno, Calif., April 3, 2018. The San Bruno Police Department received "numerous" 911 calls about a shooting at YouTube's headquarters, said San Bruno City Manager Connie Jackson. San Bruno police officers arrived at YouTube two minutes later and began combing the area for a suspect as employees fled, said Jackson. As officers entered, they found one victim at the front of the building with an apparent gunshot wound, Jackson said. SWAT team advancing into the building. Officers searching the building found the suspect dead from an apparent self-inflicted gunshot wound, Jackson said. The shooting left four victims hospitalized: three with gunshot wounds and one with an ankle injury from running from the scene, police said. Meanwhile, officers worked to clear the scene. They patted down the fleeing YouTube employees and conducted a room-by-room search. Authorities later said there was no immediate threat to the community. 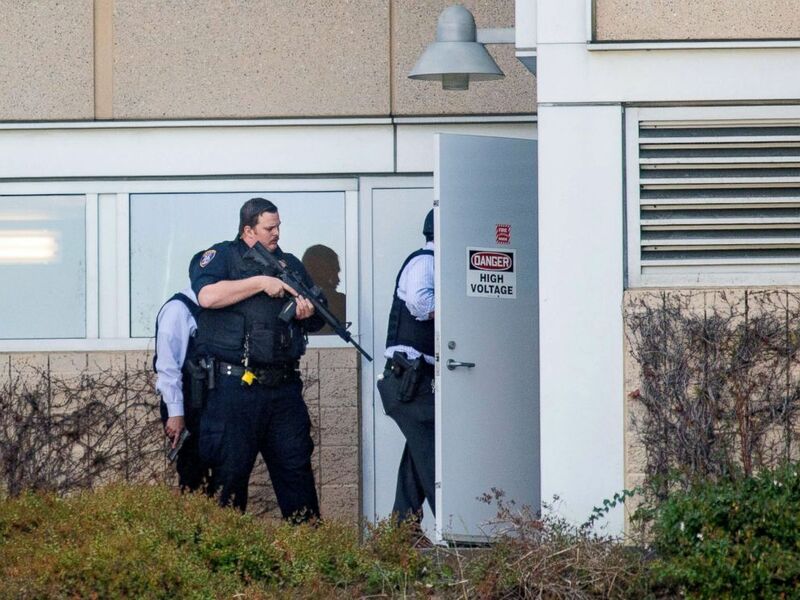 Police search a building at YouTube's corporate headquarters as an active shooter situation was underway in San Bruno, Calif., April 3, 2018. Aghdam appears to have carried out the shooting because she was "upset" with YouTube's "policies and practices," authorities said today. There's no evidence linking her to anyone at the scene, San Bruno police said. A handgun was found at scene and police said Aghdam legally possessed and owned the weapon. It was unclear where it was purchased. "There are no words to describe how horrible it was to have an active shooter today," YouTube CEO Susan Wojcicki tweeted on Tuesday. "Our deepest gratitude to law enforcement & first responders for their rapid response," she said. "Our hearts go out to all those injured & impacted today. We will come together to heal as a family."